Bruce Brubaker has long been recognized as one of the brainiest and most virtuosic among the younger generation of pianists. 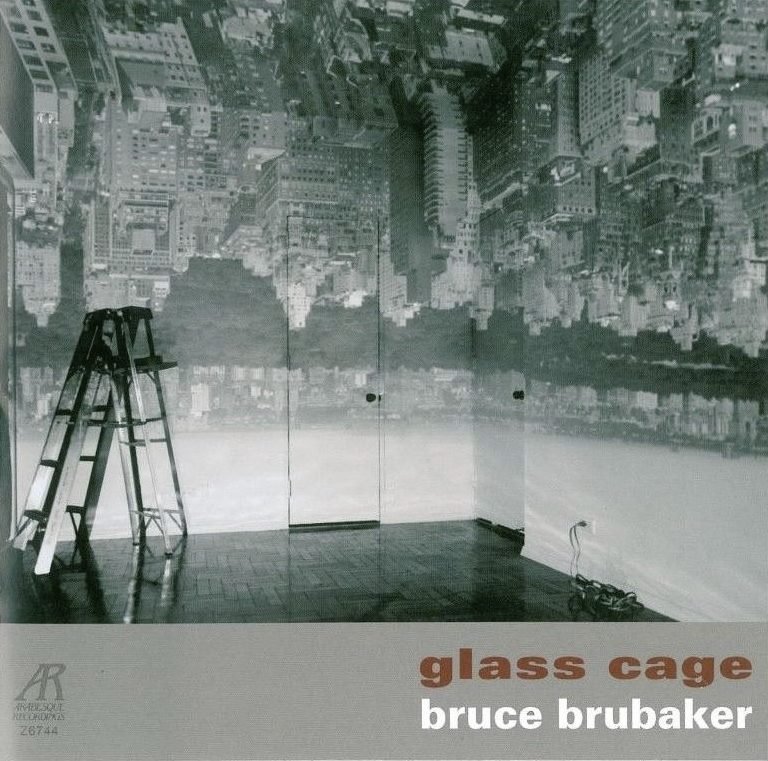 Now, on this new disc entitled Glass Cage, he has had the splendid audacity to yoke the music of two American mavericks — John Cage (1912-1992) and Philip Glass (b. 1937). And yet these compositions work remarkably well together, as the listener will discover. Cage once said that the purpose of all artistic endeavor was “to sober and quiet the mind, thus rendering it susceptible to divine influences.” The same might be said for such Glass compositions as the finale from Satyagraha and — despite its name — for Mad Rush. Indeed, most of this music is likely to inspire contemplative meditation rather than any sort of frenetic activity. Both of the Cage works date from the 1940s. “A Room” was originally composed as the as the third part of She is Asleep, an unfinished work begun in 1943. It may be played on either a standard or a prepared piano and, with typical Cagean laissez-faire, the composer indicated that the three parts of She is Asleep can be played in any order and one or more of them might be omitted. Dream, which has attained considerable popularity in recent years, was written for Cage’s longtime personal and professional partner Merce Cunningham in 1948. It is occasionally played on the viola — indeed, both of the Cage pieces on this disc were scored in alto clef — and makes its haunting, gently plaintive effect on either instrument. Cage composed a set of five piano pieces called Metamorphosis in 1938; almost exactly fifty years later, Philip Glass created his own series with the same title. In Glass’s case, the inspiration came from a play based on the Kafka short story. Movements three and four derive from some incidental music he wrote for a staging, while the three other sections found their genesis in the soundtrack music Glass composed for the film The Thin Blue Line — a remarkably mixed heritage. It was Glass’s longtime collaborator, the composer, conductor and instrumentalist Michael Riesman, who adapted the finale of the 1980 opera Satyagraha into a work for keyboard. Tracing what is essentially an unadorned Phrygian mode, repeated in groups of three against a background of subtly shifting harmonies, this music (originally an aria for central character, Mohandes Gandhi) brings the long and beautiful opera to a proportionate close. Although Glass himself has dated Mad Rush back to a New York appearance by the Dalai Lama in the fall of 1981, the composition is at least a year older than that (a recording featuring Glass himself playing Mad Rush on a portable organ was issued by the defunct arts magazine The Soho Weekly News in late 1980). No matter its origin, this is a marvelously dignified and stately processional that can serve many purposes — not the least of them to welcome a moral and religious luminary to Manhattan. Glass plays his keyboard works with a certain modernist objectivity and formal reserve. Still, to this taste, there is something deeply invigorating — indeed, revelatory — that happens when a pianist of Brubaker’s fancy and imagination takes on these scores, particularly when they are heard in close proximity to one another. Here, Brubaker has assembled a disc that seems a seventy-minute sonorous and unified invitation to elevation. Bruce Brubaker has performed Philip Glass’s solo piano music in New York, London, Los Angeles, and Boston. He has also premiered music by the legendary John Cage. He’s played Mozart with the Los Angeles Philharmonic and Brahms on the BBC… He is dedicated to extending the repertory and the way music is presented, while keeping alive the deeply expressive potential of the piano. Original music composed by Philip Glass and John Cage. Performed by Bruce Brubaker, piano. Executive Producer: Marvin M. Reiss. Produced by Bruce Brubaker. Production Director: Daniel Chriss. Post Production Director: Jodi Howard. Recorded at Cowles-Kruidenier Auditorium, Iowa Historical Society (Des Moines) on July 1-3, 1997. Mastered by Bob Katz at Digital Domain. Engineered by David L. Rick. Edited by David L. Rick. Piano: Steinway CD 202. Piano Technician: David Liljedahl. Front Cover: Abelardo Morell, Camera Obscura Image of Manhattan View Looking West in Empty Room, 1996, © Abelardo Morell, courtesy of Bonni Benrubi Gallery, New York. Design: Mathew Dalessi. © 2000 Arabesque Recordings a division of the Rebot Corporation 32 West 39th Street / New York NY 10018.